What’s coconut praline pie? Creamy rich coconut custard is smoothed over a rich layer of pecan praline for a pie that is totally unique and absolutely delicious. Let me tell you a little story about this here coconut praline pie. It was raffled off for over $65.00. Yep. Seriously. Is it that good? I have always loved coconut cream pie — really any cream pie for that matter. I don’t make them nearly enough and I am not even sure why. They are so easy to do! I swear to you that this pie is so good…. well, you know how there is supposed to be a feast in Heaven? Well, I am pretty sure this is gonna be on the table. *Someone said that this was too much for their 9 inch pie pan, so I suggest that you use a 10″ if you have one. It fits in my 9 inch pan just fine. Sorry if you have had a problem. Rich and buttery pecan praline covered with a creamy layer of coconut cream and then chilled. Cover with whipped cream just before serving. Melt the brown sugar and butter together, stirring constantly until the sugar loses it's graininess. Quickly pour the mixture into the bottom of the prepared crust, spreading to cover. Sprinkle with 1 1/2 c chopped, toasted pecans. Whisk the sugar, flour, egg yolks, salt, and milk. Microwave for 9 minutes or so, stirring about every minute, until mixture coats a spoon. You can also use a double boiler but guard against scorching. Let cool for about 5 minutes and then add the vanilla and butter. Pour the mixture over cooled praline layer and chill with a layer of greased plastic wrap over the surface. 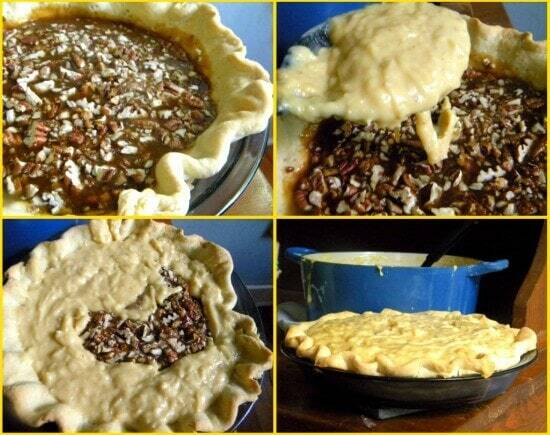 This works best if you spoon the filling around the edges of the pie first, and then fill in the middle. Just before serving whip a pint of cream with sugar to your taste and place a thick layer over top of the pie. Sprinkle with toasted coconut. I like to plate this on a dessert plate drizzled with some of the praline syrup. and then dusted with confectioner's sugar. It just seems to jazz it up a little and make things looks special. 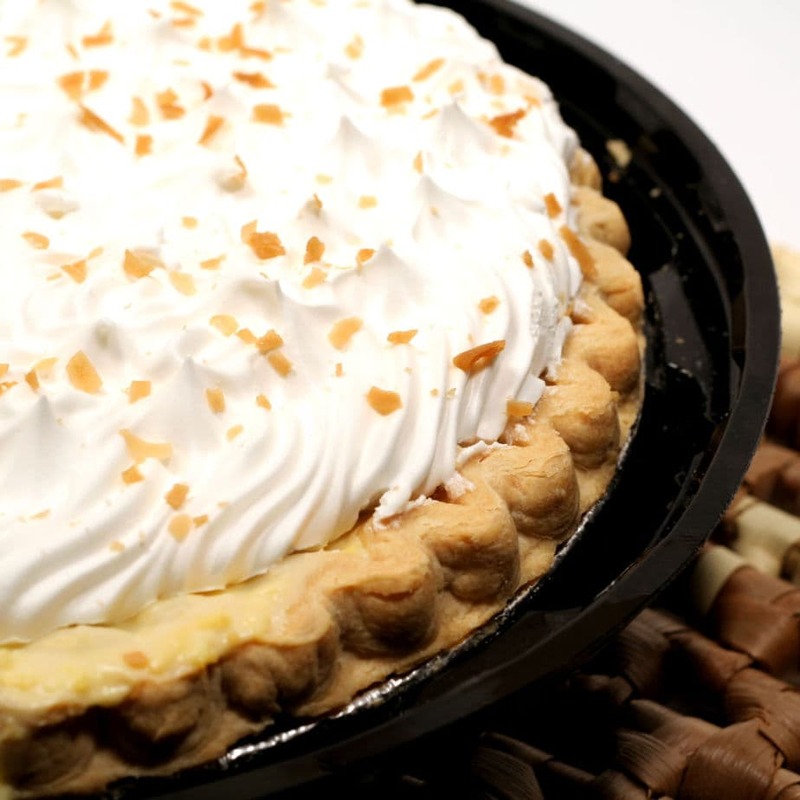 I’m not big on praline pie… usually… but this one with the coconut has me intrigued. I’m thinking Thanksgiving! Now that is a gorgeous looking pie!! Thanks… It is soooooo rich but soooooo yummy! I’m drooling that looks fabulous! It is really good… and a unique change from classic coconut. I too have had problems with this recipe. Twice I’ve tried to make it and the coconut filling did not set, it remained very liquid. I did not use the microwave, but used a double broiler. After stirring for about 20 minutes with no thickening up, I added cornstarch and it thickened it up. Not quite sure what the issue was since I followed the recipe to a tee both times. Tastes delicious though. That’s very strange. I even bought a deep dish pie crust. Since it came with two shells I made more of the first layer, and although I didn’t have enough pecans as in the recipe, I had plenty of the cream filling to go again all the way to the top of the pie crust. I guess I ‘m happy I now have two pies for work instead of one, but it would have been much easier if I had made them both at once and separated the pecans. I look forward to tasting and sharing it. Thank you. This recipe was VERY frustrating because it makes TWO pies and not one! I poured ALL of the first mixture into a DEEP DISH pie crust like it said to do, then when I added the pecans the pie was almost filled to the top! I took some of the pecans out, but did not want to ruin the crust by trying to scoop out filling. Then of course there was double of the top layer. VERY FRUSTRATING! I’m sorry Angie. This is the way I make it and it fits just fine. Not sure what the difference is. Wow. I think I’m in love. I swoon over pralines, and I can never eat too much coconut. It’s like my universe has shifted…I would pay $65 for this pie too! LOL thanks Alta. where were you when I had my restaurant, hmmmm? Wow… my mom would KILL for this pie, she loves both of these elements. You are a genius, you know that? Aww, thanks Love. A genius? Hmmm… it is a great pie though. Lordy, this pie looks amazing! I love coconut–love it! I seriously need to try this, and soon. I love that the coconut cream isn’t too sweet–perfect! One of these days I am gonna make it with coconut milk to see what happens… let me know how you like it.